Anna Parkinson is Associate Professor and Director of Graduate Studies in the Department of German, Interim Co-Director of the Critical Theory Cluster, and an affiliate of the Gender and Sexuality Studies Program at Northwestern University. 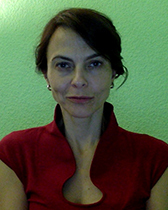 Her research has been supported by grants from institutions including the DAAD, the Andrew W. Mellon Foundation, the Deutsches Literaturarchiv (Marbach), the American Psychoanalytic Association, the Association for Women-in German, the "Languages of Emotion" Excellence Cluster at the Freie Universität Berlin, and the Mandel Center for Advanced Holocaust Studies at the United States Holocaust Memorial Museum. Teaching and research interests include: twentieth and twenty-first century German-language literature and film, psychoanalytic and critical theory, modern South African literature and film, memory studies, literature of migration, gender and queer theory, literary theory, genocide studies, and media of the Cold War era.